Across our services in Ayrshire and Glasgow parents are supported to come together in a friendly and safe environment to develop connections and friendships; share their experiences; their own knowledge, learning and expertise; whilst planning and co-designing initiatives within Stepping Stones for Families (SSfF) that have value to them. We call this The Stepping Stones for Families Parent’s Forum. The forum is a mechanism that enables isolated parents to meet other parents and carers from a diverse range of cultures and communities. As part of the Scottish Government’s Best Start Grant Consultation, our Ayrshire Parent’s Forum received and welcomed an invitation from the Scottish Government for a visit, to contribute to the national conversation that is currently underway across Scotland. 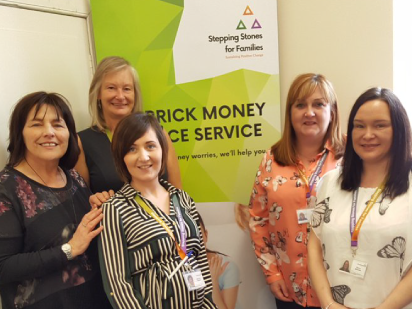 Through our Carrick Money Advice Service, (CMAS) our Ayrshire Parent’s Forum has also reached out to other local organisations in Carrick Areas. The aim being to widen opportunities for parents who live in the same area, to connect with each other and share their views and experiences with the Scottish Government. As an organisation we know that by listening to what matters to people, by designing and shaping support in partnership with families, empowers people to create and sustain positive change in their lives.